All new vehicles are equipped with three main friction braking products, comprising of the caliper, brake disc and brake pad set. When it comes to replacing these safety-critical components, we recommend that Original Equipment products are fitted in accordance with vehicle manufacturers’ specifications. Imperial Engineering is an Authorised Distributor for Knorr-Bremse, Meritor and Wabco friction braking systems, the three primary OEMs when it comes to friction products. It is important to use the correct fitments for each vehicle in order to optimise the performance of the friction braking system, as well to guarantee safety. We are sensitive to keeping costs to our customers to a minimum and have therefore developed a range of serviced Knorr-Bremse calipers and Wabco calipers, following appropriate training from both manufacturers. 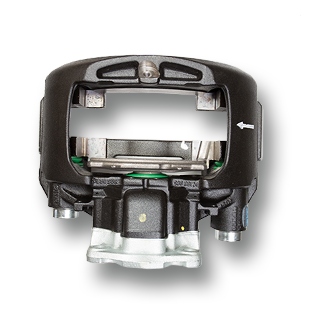 We also promote Meritor’s ‘Green’ range of remanufactured calipers. Whilst these options ensure costs are reduced, operators can be assured that they are not compromising on quality. There is a varying range of alternative friction products available in this category in terms of price and quality. We are able to provide a cost-effective solution to your requirements using tried and tested suppliers by offering aftermarket alternative products, if required. Do the brake pads on your buses wear out far quicker than anticipated? The problem could be more serious than just high replacement costs as vehicle safety could be compromised. A quick check to see if you are fitting the correct brake pads will save you money and assure optimal braking performance. Brake output at the wheel can only be assured if the correct grade of friction material is used. This is a safety-critical factor and no compromise should be made. Imperial Engineering only supplies OE material brake pads to ensure maximum safety and performance standards as found on the vehicle when new.